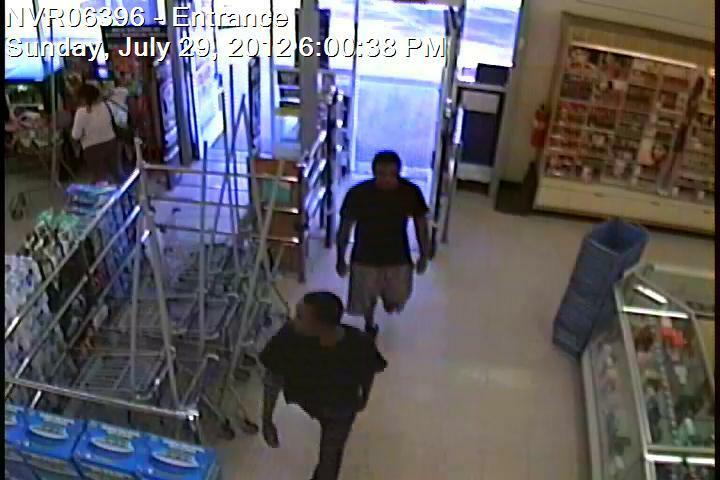 PALMDALE – Do you recognize the men in this surveillance image? If so, Palmdale detectives would like to hear from you. The duo went into an east Palmdale Rite Aid, stuffed bottles of liquor in their pants, and then shoved an employee out of the way who tried to stop them from leaving the store, authorities said. On July 29, 2012, at 6 p.m., a store employee of the Rite Aid, located at 2419 East Ave S, in the City of Palmdale, was assaulted when he attempted to stop two shoplifters. The employee saw the suspects each take a bottle of alcohol and hide it in their trousers. When they attempted to leave the store without paying, the employee asked them to return the alcohol. The suspects shoved the employee out of the way and fled the store with the stolen alcohol. The suspects appear to be two Black males ranging between 18-20 years old. The two are described as slim build and were wearing black T-Shirts during the theft. Anyone recognizing the suspects is asked to contact Lieutenant Kennedy of the Palmdale Detective Bureau at 661-272-2506. Individuals can also provide information anonymously through “Crime Stoppers” by dialing 800-222-TIPS (8477), texting the letters TIPLA plus your tip to CRIMES (274637), or using the website http://lacrimestoppers.org.